ViewSonic LightStream™ PJD5154 offers an impressive audiovisual performance to improve presentations, ideal for use in educational and small business environments. Exclusive SuperColor™ technology offers a wider color range for true-to-life image projection, while SonicExpert® technology delivers improved sound quality. Packed with 3,300 lumens, native SVGA 800 x 600 resolution, and a 22,000:1 contrast ratio, this projector is guaranteed to reproduce the finest of details regardless of the ambient light level. The projector also features HDMI digital connectivity, supporting media-rich presentations. An energy-saving SuperEco feature reduces power consumption by up to 70%, and extends the lamp life by up to 10,000 hours. 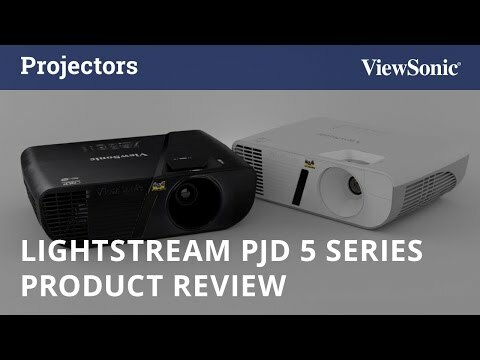 With advanced audiovisual features, flexible connectivity options, and an affordable price, the LightStream™ PJD5154 will help you present at your best. 3,300 lumens of brightness and a 22,000:1 high contrast ratio guarantee the production of bright images in any environment, including rooms with high ambient light. Choose from 5 unique viewing settings to provide the best possible viewing experience. Screen color mode lets you project onto surfaces other than a screen or white wall by automatically correcting the color and brightness of projections. This LightStream projector has been designed with ViewSonic’s proprietary SonicExpert® technology, which incorporates an enlarged speaker chamber and a more powerful amplifier to deliver an immersive audio experience. The energy-saving SuperEco® feature reduces power consumption by up to 70% and extends lamp life by up to 10,000 hours. SuperEco® mode is also auto-activated whenever the projector is idle. Start your LightStream projector with ease.